Successfully Added Room Air Purifier - Ozone and Ionizer (220V) to your Shopping Cart. 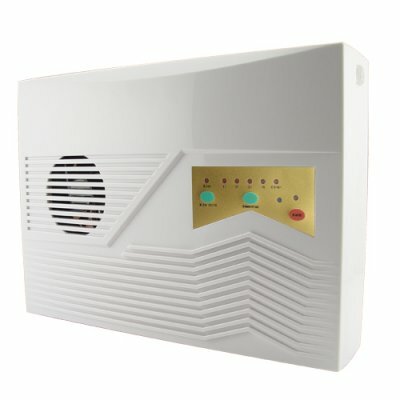 Room sized air purifier for making your room or small office air-space cleaner. Designed to sterilize the air inside a bedroom or small work space with ozone and negative-ions, this unit helps to clean and purify the air. How? Through the release of ozone and negative ions, this unit reduces the growth environment necessary for bacteria and molds, thereby making the air in your room cleaner and safer. This unit is useful if you have wooden, paved or laminated floors, oxidizing any dirty air, thereby helping those with allergies and air sensitive conditions such as Asthma and Emphysema. A perfect addition to every actively used bedroom or small office. With the tightening economy we know people will be looking to spend their limited disposable income by upgrading their home versus taking expensive vacations. So secure some new sales for yourself by stocking up on this new item to sell at your online / physical store or feature it in your latest eBay, Amazon or uBid listings and use our blind dropshipping service to maximize your limited resource of time. Offered exclusively by your favorite wholesaler - Chinavasion. Room sized air purifier for making your room or workspace air cleaner and fresher. Timer controlled - one cycle in the morning and one cycle in the afternoon is all that is needed for cleaner air through the day. The default power supply for this product is for 220V AC. If you require 100-120V AC, please order CVSEQ-A5100-110V.